The HANDFREE DOG LEASH has been designed using our Zero Shock technology— a shock absorbing component that drastically reduces strain and pulls on the dog and the owner. Utilising soft touch webbing and a generously-sized neoprene handle, this leash really is a pleasure to hold in your hand and is perfect for walking and jogging with your dog. Zero-shock technology: Shock reduction improves control and cushions and eases the pressure for both the owner and the dog. Waterproof material: Enjoy the comfort and durability of a fully neoprene-lined padded handle that makes any outing comfortable. Keeps Your Dog Safe: The Handsfree Bungee Dog Leash has a unique formula of flexibility and strength that dissipates quick forces and optimizes comfort and safety for both you and your dog. 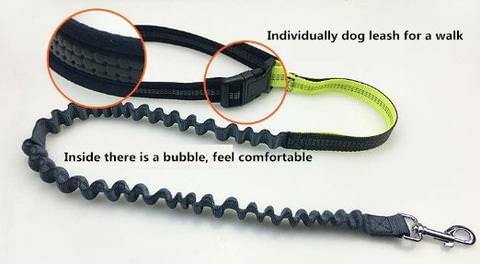 1 X HANDFREE DOG LEASH.